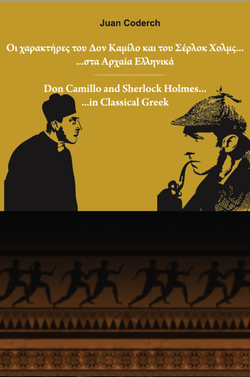 This book is the translation of one of the cases of the famous detective Sherlock Holmes, by Sir Arthur Conan Doyle, into Classical Greek. It is published together with the translation of Don Camillo. The chosen case is "The Case of The Three Students". It is not one of the best known cases of Sherlock Holmes, like for instance "The Hound of The Baskervilles", and it is a rather short case, but the reason for choosing it is that it deals around three university students of Classics and the theft by one of them of the text of an unseen paper from Thucydides that they should translate at the following day. Obviously, there wasn't a better case for translating into Classical Greek.